Cimex lectularius is a species of Cimicidae (bed bugs). Its primary hosts are humans, and it is one of the world's major "nuisance pests". Investigations into potential transmission of HIV, MRSA, hepatitis B, hepatitis C, and hepatitis E have not shown that bed bugs can spread these diseases. However, there is some evidence that arboviruses may be transmissible. Cimex lectularius goes through five immature life stages that each require a blood meal to develop and move on to the next stage. Blood meals are necessary for each life stage in order to reproduce. They tend to feed exclusively on humans. C. lectularius are obligate blood feeders. C. lectularius typically feed on hosts when they are asleep. Haematophagous insects can use body temperature, moisture, carbon dioxide and visual cues to locate a host. (Siljander) C. lectularius is found all over the world in almost every area that has been colonized by humans. ^ Kolb, Adam; Needham, Glen R.; Neyman, Kimberly M.; High, Whitney A. (2009). "Bedbugs". Dermatologic Therapy. 22 (4): 347–52. doi:10.1111/j.1529-8019.2009.01246.x. PMID 19580578. ^ Melnick, Meredith (12 May 2011). 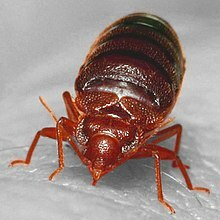 "Study: Bedbugs May Carry MRSA; Germ Transmission Unclear | TIME.com". Time. Retrieved 11 November 2013. ^ "Do Bedbugs Spread MRSA and VRE?". Webmd.com. 11 May 2011. Retrieved 11 November 2013. ^ Adelman, ZN (Aug 2013). "Bed bugs and infectious disease: a case for the arboviruses". PLoS Pathogens. 9 (8): e1003462. doi:10.1371/journal.ppat.1003462. PMC 3744395. PMID 23966852. ^ Doggett SL, Russell R (November 2009). "Bed bugs – What the GP needs to know". Aust Fam Physician. 38 (11): 880–4. PMID 19893834.